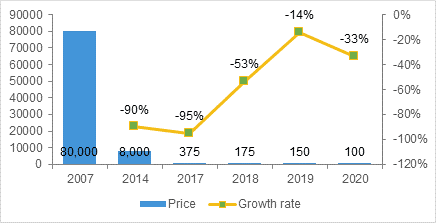 "Technavio forecasts the worldwide automotive LiDAR sensors market will see a compound annual growth rate of more than 34% up to 2020. 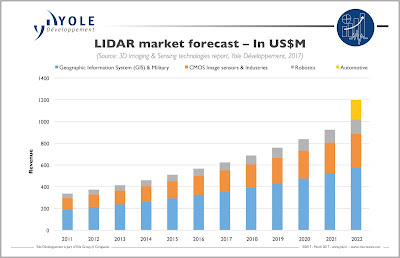 The market research firm estimates the automotive LiDAR market was worth $61.61 million in 2015, with most of the spending in the Europe/Middle East/Africa region and in the Americas. Leftover from April 1st, or just an old Publication ? Velodyne, LeddarVu, Quanergy, etc. do research on "employing efficient processing techniques" and do "position products" as do many Companies. Lidar is entering the Solid-State Age. Rotating Lasers are years old, pucks and cubes that provide equal quality to mid-range mechanical systems are what's new. They can replace all but the very best mechanical Lidars and like all Lidars they measure precisely in the dark; something not offered by most Cameras or Radar (especially not for U$50 to a few hundred dollars). Your Post ends with a quote that we will see Solid-state in a few years, yet many Companies have been in production for that long. Even small Drones have Lidar nowadays. ToF cameras see quite well in the dark, as good as any LiDAR. @ Your Post ends with a quote that we will see Solid-state in a few years, yet many Companies have been in production for that long. Do you see any car in production that use a solid-state LiDAR? I'll have a look, do you require Sales of over 10M vehicles in order to count as a correct answer?